The Chinese machinery industry recorded sluggish demand in the second half year of 2014, in line with the cooling down of China´s economy. Given a forecast 6.5% GDP growth in 2015 China´s economic performance will remain weak compared to previous years, despite efforts by the central bank and the government to stimulate growth. However, with the Chinese government planning additional investment in infrastructure construction, a modest rebound in machinery demand can be expected in H2 of 2015. Due to the economic slowdown and decreased demand from key buyer industries, the profits of many Chinese machinery businesses has deteriorated significantly over the past twelve months. And despite some opportunities in overseas markets and new government investment programs it is expected that companies´ profits will decrease further. This is mainly due to high overcapacity in the sector: profits of machinery businesses will be squeezed further by fierce competition, as companies have to offer lower prices to keep market shares. Keeping market share also means providing favourable payment terms to customers, but this requires more cash to support the business. Additionally machinery manufacturing is a highly capital- intensive business, as large investments on fixed assets are common. Therefore, financing requirement and gearing is high in this sector. But at the same time the current lending policy of Chinese banks is not favourable, especially for privately-owned small and medium-sized enterprises. Banks are increasingly reluctant to lend due to a large amount of non-performing loans in 2014 and the economic slowdown. If bank loans are provided, usually additional security is required, such as fixed assets and personal property guarantees. The average payment duration in the Chinese machinery industry is 90-150 days. As credit conditions have been tightened since 2014, many smaller and/or privately owned machinery businesses face liquidity issues, leading to slower payments and even payment defaults. Recently, the Chinese State Council has announced plans to remove a lending cap at commercial banks in a bid to boost flagging economic growth, which might help some companies get additional loans. 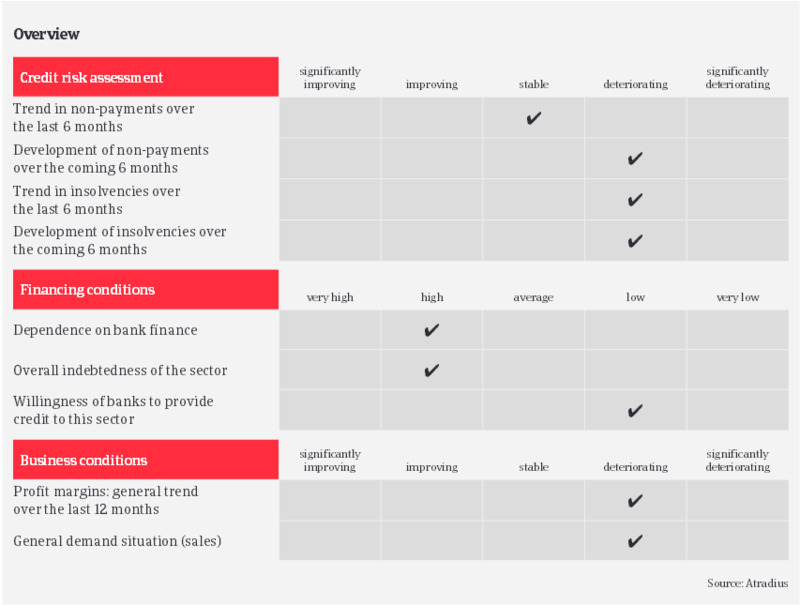 But given the lower economic growth and decreasing demand it is not expected the payment conditions in the machinery sector will improve in the short-term. We barely monitor proper insolvency procedures in China (most of the business failures end-up with the owner disappearing). However we have observed many small machinery companies shutting down their businesses in 2014 and in the first half of 2015, and this trend is expected to continue. to optimise economies of scale there is currently an increase in mergers and reorganisations of smaller companies. In contrast to their smaller/privately owned peers, larger and state-owned machinery companies are doing better, as it is much easier for them to get financial support from a parent company or the government when they are in trouble. Therefore their payment records are better and their business resilience is higher. In general our underwriting stance is rather restricted for machinery companies, given the current difficulties - mainly for smaller/privately owned businesses. 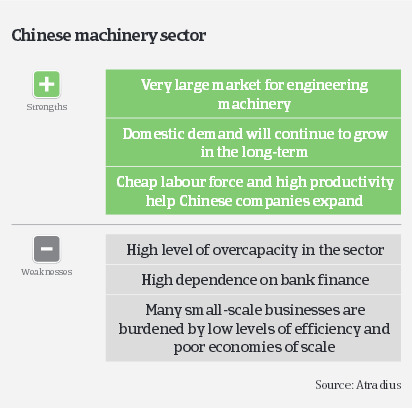 However, our underwriting stance is more open for the engineering machinery subsector, as China is one of the largest engineering machinery markets in the world and has attracted investment from major foreign companies. Turnover of the large key players account for more than 85% of sales in this segment. With the government planning further investment in infrastructure, this subsector´s performance should improve in the future. While our underwriting stance for electrical machinery is neutral, we are restrictive on textile machines due to the downturn of the textile industry.